The position taken by the writer of this volume should be clearly understood. It is not the view known as antivivisection, so far as this means the condemnation without exception of all phases of biological investigation. There are methods of research which involve no animal suffering, and which are of scientific utility. Within certain careful limitations, these would seem justifiable. For nearly forty years, the writer has occupied the position which half a century ago was generally held by a majority of the medical profession in England, and possibly in America, a position maintained in recent years by such men as Sir Benjamin Ward Richardson of England, by Professor William James and Dr. Henry J. Bigelow of Harvard University. 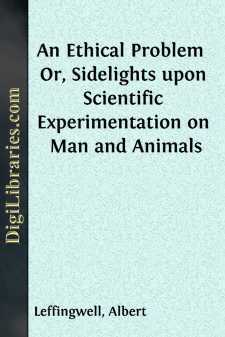 With the present ideals of the modern physiological laboratory, so far as they favour the practice of vivisection in secrecy and without legal regulation, the writer has no sympathy whatsoever. An ethical problem exists. It concerns not the prevention of all experimentation upon animals, but rather the abolition of its cruelty, its secrecy, its abuse. Written at various times during a period extending over several years, a critic will undoubtedly discover instances of repetition and re-statement. Now and then, it has seemed advisable to include matter from earlier writings, long out of print; and new light has been thrown upon some phases of a perplexing problem. Will it tend to induce conviction of the need for reform? Assuredly, this is not to be expected where there is disagreement regarding certain basic principles. First of all, there must be some common ground. No agreement regarding vivisection can be anticipated or desired with any man who holds that some vague and uncertain addition to the sum total of knowledge would justify experiments made upon dying children in a hospital, without regard to their personal benefit, or sanction the infliction of any degree of agony upon animals in a laboratory. A liking for the use of italics as a means of directing attention to certain statements is confessed. But wherever such italicized phrases appear in quotations, the reader should ascribe the emphasis to the writer, and not to the original authority. Another edition of this work being called for, the opportunity for one or two emendations is afforded.